Many of Iraqis dished can be called «general Arabian» (and some of them have an Indian or Persian origin). But interesting point is what dishes from immense Middle East cuisine became a national in Iraq and what variation of cooking exactly came to stay in Iraq. In every Arabic country there is a specific, unique cookery picture (or pattern). It reminds variation of Arabic dialects – one dish, Arabic language, it is used in every country and each of them makes it its own way. 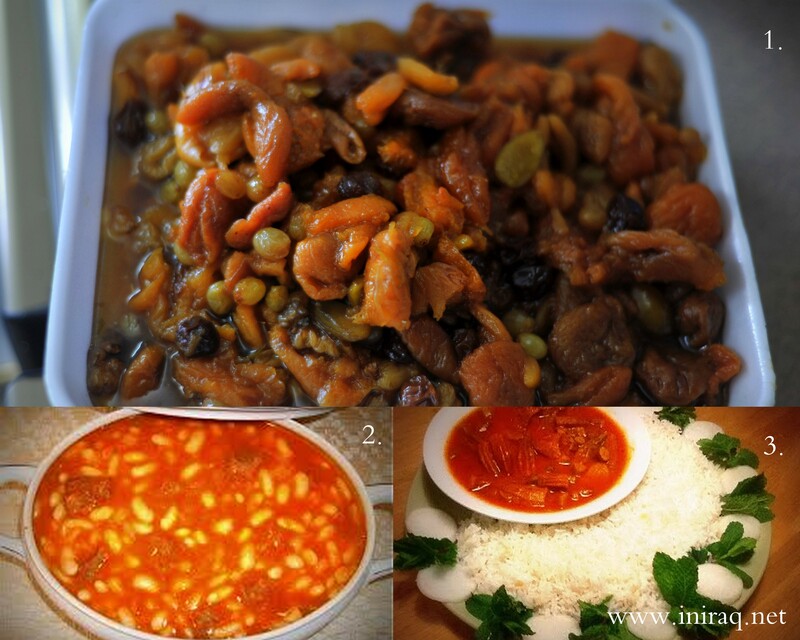 Marag is a thick soup from tomato juice with pieces of meat (usually it is mutton, that was pre fried with onion, garlic and spices) and with one of following ingredients: 1) okra; 2)phaseolus; 3) eggplant; 4) spinacia and chickpea; 5) zucchini and chickpea; 6) potato; 7) dried fruits (this marag is called “turshane”); 8) fish. Accordingly the main ingredient the dish is called – marag okra, marag phaseolus. Magar is eaten hot, putting it above rice (usually it is basmati rice). 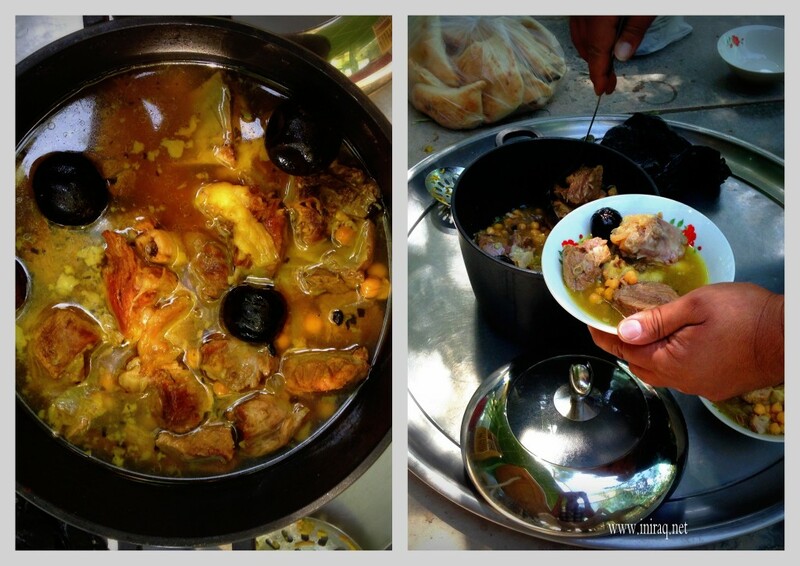 This lunch is common for Iraqi in daily life, they may prepare it even every day, just changing the main ingredient. 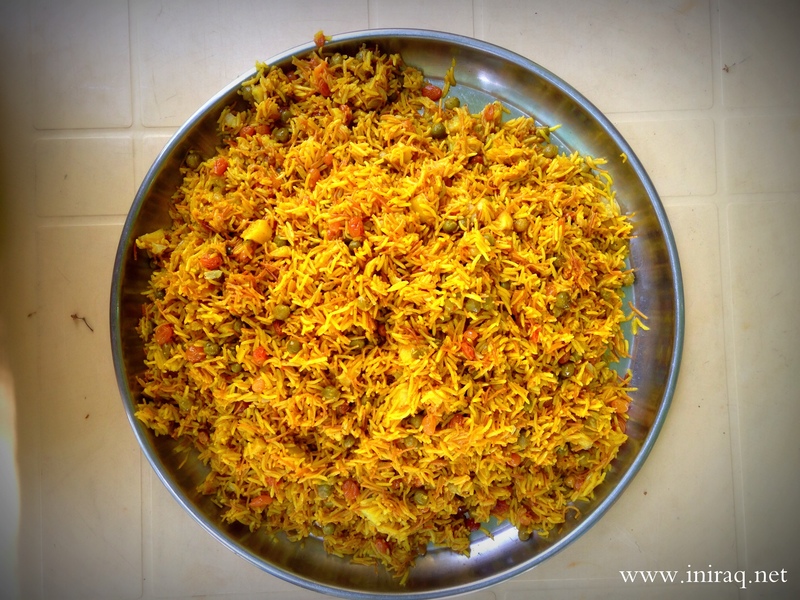 Biryani is a mix of rice, pieces of meat (mutton), cubes of potato, short thing macaroni (whitch are fried till brown color and boiled after that), green pisum, raisin and special spice. Ingredients are prepared separately and after that are mixed. Biryani is eaten with yogurt and salad. 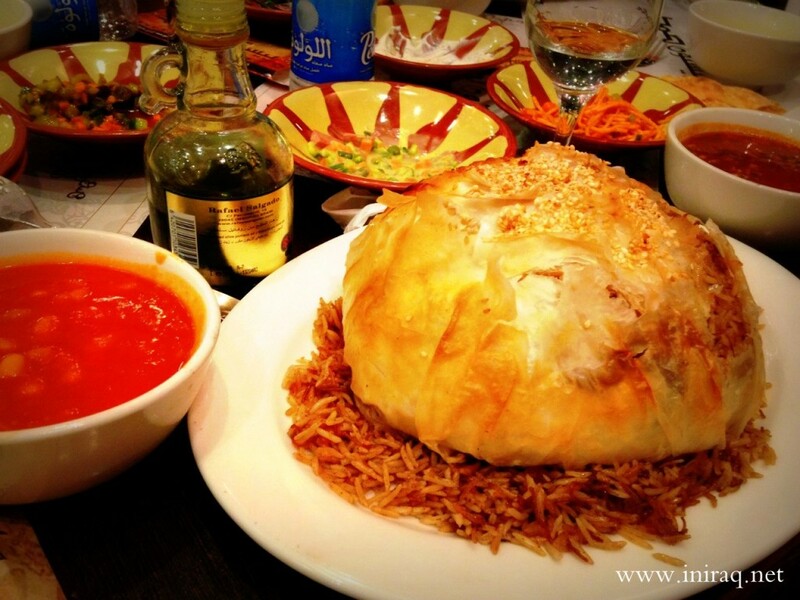 There is many variants of this dish, because its origin is Indian, from where it spread through Middle East. 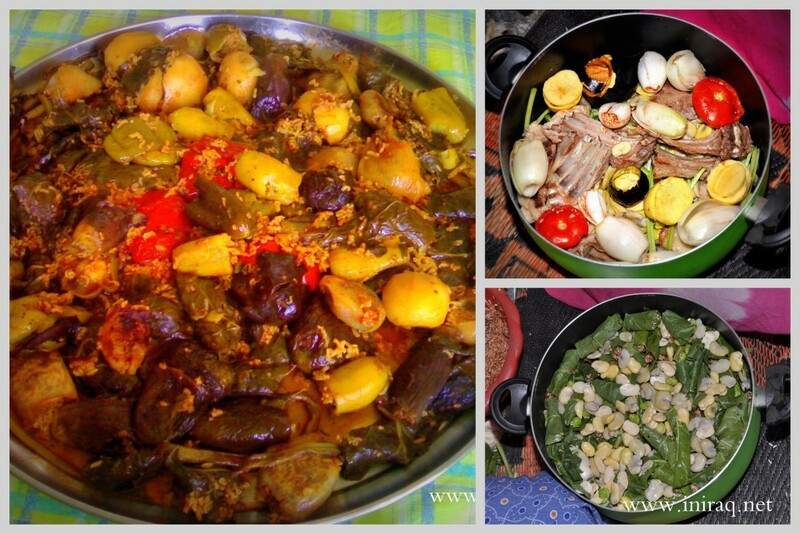 What is dolma? Dolma is stuffed vegetables and grape leaves. Grape leave dolma is famous in the world, sure everyone had eat Armenian and Turkish dolma, but Iraqi dolma is kind of different. For stuff are used such vegetables as tomato, potato, onion, pepper and grape leaves, sometimes it could be also eggplant. It stuff by mix of rice with small boiled meat (mutton), tomato paste and spices. Trunks of special leaves are putting on the base of saucepan, then – green broad beans. 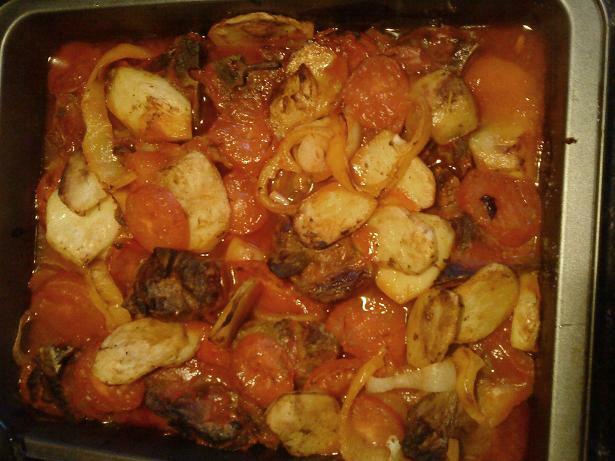 Above it is putted stuffed vegetables and leaves and in the midst of it boiled mutton slats. After that the saucepan is filled by water and putted on the fire. It is taking out this way – the saucepan is tuned over on the silver tray, so broad beans appear above. 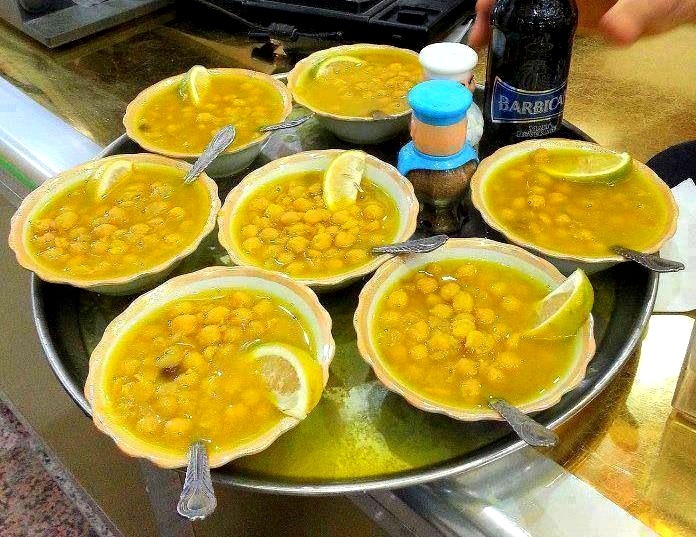 It is fried small balls made from pisum dough and it is very popular dish in the whole Middle East. For bough soaked pisum is converted into flour, into it spices and soda are putted. After that the small doughnuts are made by special tool. This doughnuts are fried in a very hot oil. For eating it falafel is putted into bread together with salad (and it looks like burger. 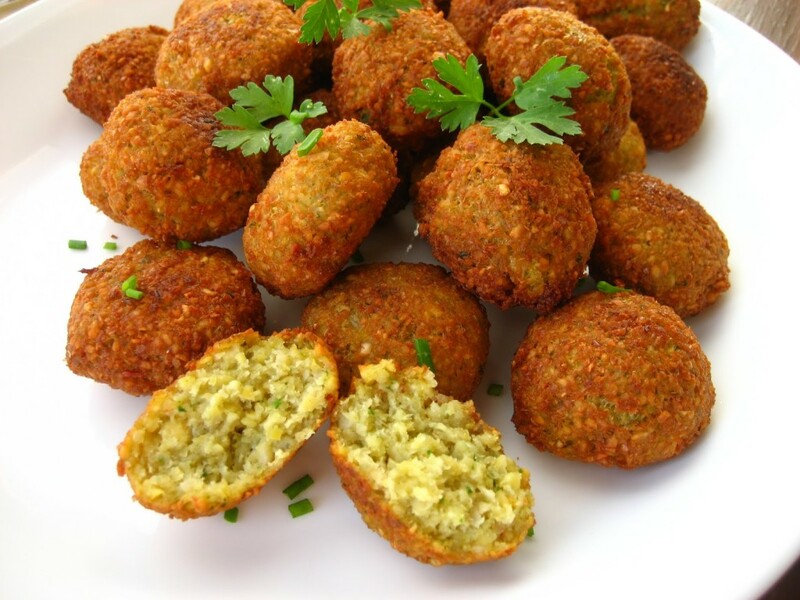 Falafel is eaten with sauce Amba (made from mango). Tishrib is a soup from mutton meat (which was boiled till it became very pithy). Also potato, chickpea, onion and numi-Basra are added into it. It is taken away this way – on the base of plate bread is putted, above it potato, chickpea and pieces of meat are putted and all this are poured on by broth. Also onion and numi Basra could be putted above. 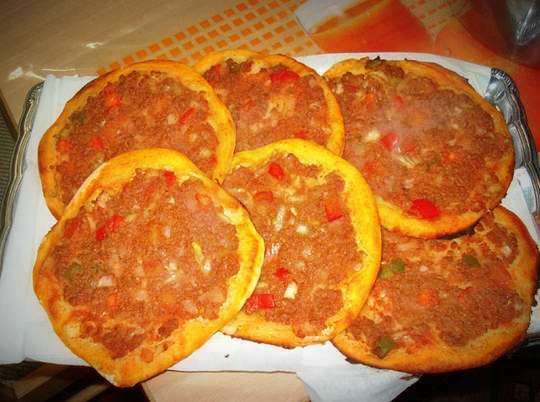 Arabian kebab is a fried cutlets made from such mincemeat: mutton, tomato, a little, flour, salad potherbs, and spices. Thing cutlet is formed by hands and it is fried in hot oil. Kabab is eaten with salad and bread. 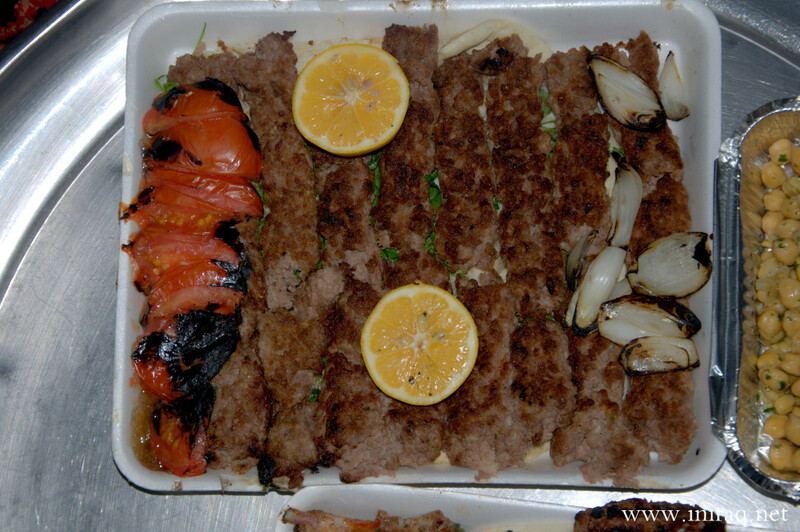 If kabab was made on the bazaar, by special man, it looks thicker and longer and has a dark-brown color, because it is made not in oil but on the fire. 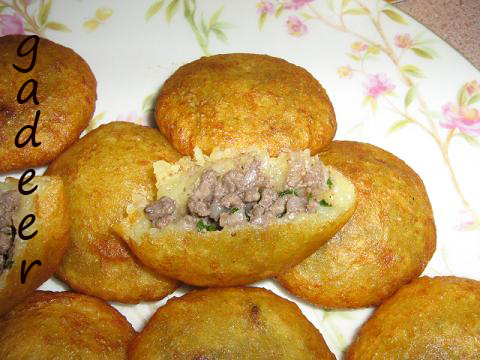 Kubba is small bolls from dough stuffed by meat. Dough for kubba has a two kinds – from rice flour and potato and from burgul (it doesn’t need to be grinded). For stuffing mutton, onion and spices are used. Small circles from dough are made by hands, after that it filled by mincemeat and ball is formed. Kubba can be boiled in shorba, magar soup or fried. This is a soup made from lentil, potato, thing macaroni, meat broth, onion and dried lime. This is other kind of soup. It made from chickpea. 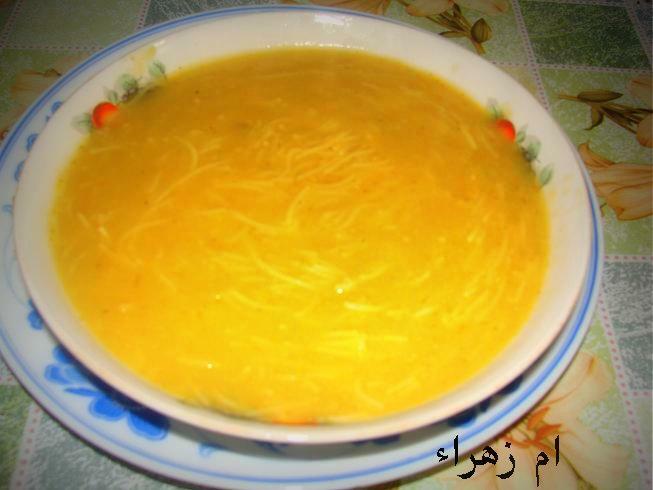 Iraqis usually warm-up themselves by this soup in the cold season. Also it is eaten with adding a lemon juice. Ingredients: potato, tomato, onion, eggplant. They are sliced into flakes. Every ingredient fried separately and after that is putted above each other. Among vegetables small pieces of mutton are putted. 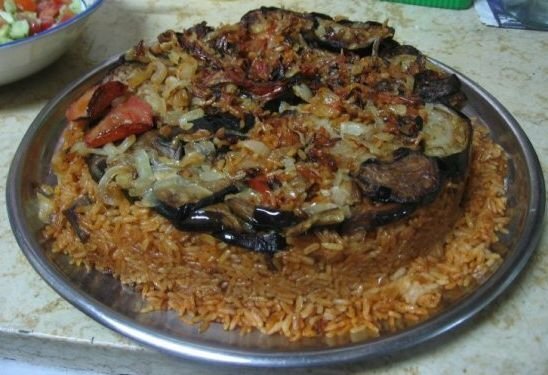 Ingredients: rice (basmati), fried tomato pieces, eggplant, onion, potato, pieces of mutton. This dish looks like pizza. It could be called Arabic pizza. The mutton mincemeat is putted on the thing dough and baked. Lehm bajeen is translated as Meat in the dough. This is a quite big ball made from puff pastry and filled by rice, thin macaroni (which was fried and boiled after that) and pieces of meat. Bacha is a boild sheep head. It is served only in restaurant. 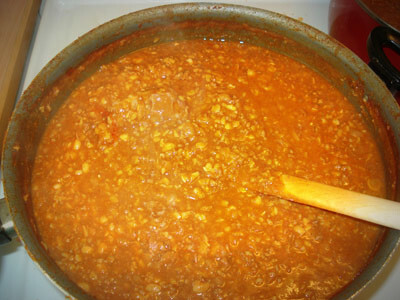 Qeema is made one time a year because it is very hard to do. This is a boiled meat, which milled till gruel and also garlic and spices are added into meat. Broad beans (as a breakfast or dish which eaten with kabab) are boiled. After that a big omelet is fried. Broad beans are putted into the big square deep plate. Bread is putted on the base, after that – omelet and broad beans and above all this – broth. Masguf is a way for grill. 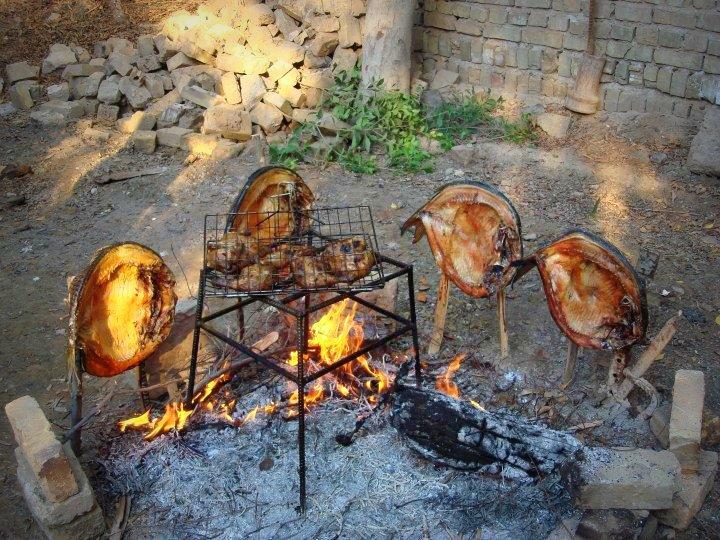 In Iraq the fish is grilled such way. The fish must be opened from her abdomen, fixed on the stake near the fire (not above the fire but near). It is eaten with grilled tomatoes and onions and lemon juice. Read more about Iraqi cooking in the next articles. Yeah…seems like you have posted all my favorite recipes….will make an attempt to try this at home…Do please share more.